Lessons have been going strong for about 2 years now, and everything is great, except – we have more kids than ever and not enough quality machines to go around…. 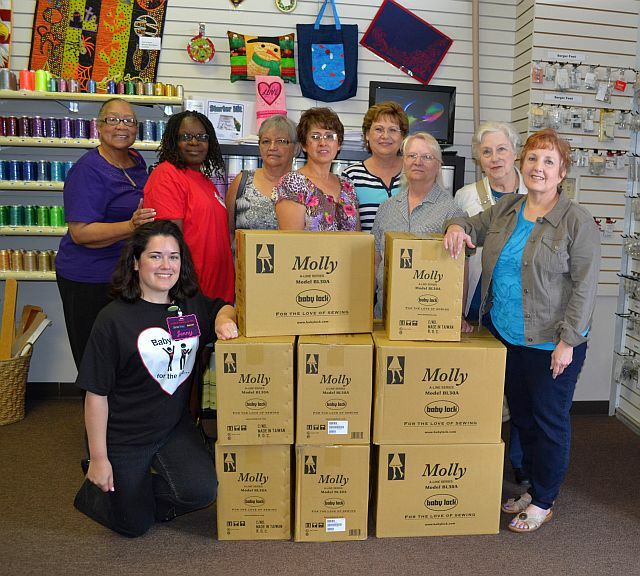 Soooooo, I let the President of Baby Lock know what we’ve been up to and our present needs….. the next thing you know, there are 10, yes, TEN brand new Baby Lock Molly’s arriving at Humble Sewing Center as a donation to the safe-house!!!! I told the ladies at our monthly Baby Lock Club about the donation and they agreed to be in the picture with me! This is a wonderful group of ladies who meets with me once a month to share ideas, tips, and sewing techniques for Baby Lock sewing machines, embroidery machines, and sergers. It’s always fun! Drop in sometime! Dates and details are on our calendar. Today, I was able to deliver the 10 Molly’s to the safe-house! Here’s a photo of a safe-house resident getting familiar with the new machine. One, two, three, four, five, six, seven, eight, nine, TEN beautiful Molly’s all ready to SEW!!! I’m SO thankful to get to spend time with these precious girls and help them learn a valuable life skill. 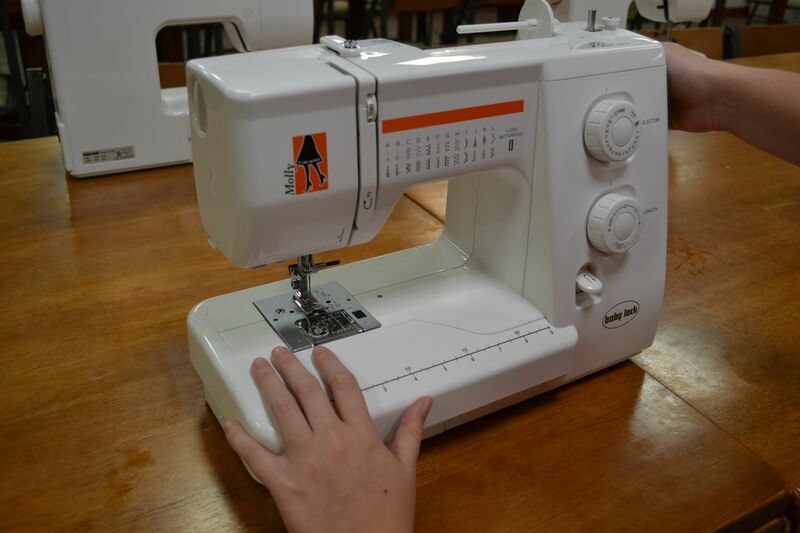 This entry was posted in Classes, Sewing Machines and tagged Baby Lock Molly, sewing with kids on August 31, 2014 by Jenny Gabriel. Special Financing on Babylock products now through Monday, February 27. No interest for up to 48 months, with a minimum approved purchase on Baby Lock machines when you use your GE/Home Design card. This offer valid at participating Baby Lock Retailers 2/23/12 through 2/27/12 and applies to 24 months on purchases of $1,000 or more and 48 months on purchases of $5,000 or more. Subject to credit approval. Minimum monthly payments are required during the promotional period when you use your Home Design card. No finance charges will be assessed if (1)promo purchased balance paid in full within 48 months and (2)minimum payments on account are paid when due. Otherwise, promo may be terminated and treated as a non-promo balance. Finance charges accrued at the purchase APR will be assessed from purchase date. Regular rates apply to non-promo balances, including optional charges. Promo purchases on existing accounts may not receive full benefit of promo terms, including reduced APR if applicable, if account is subject to penalty APR. Not valid on previous purchases. This entry was posted in Embroidery Machines, Sergers, Sewing Machines, Uncategorized and tagged babylock, finance on February 25, 2012 by Designs by Marje. The Holidays are coming and some of you may be ready to buy your first sewing machine, embroidery machine, or even your very first serger. If so, good for you! You’re worth it! Choosing the right machine can be an overwhelming task so I’m posting some shopping tips here for your review. Keep in mind, the ideas expressed here are my personal opinions and do not necessarily represent SewVac Outlet’s staff or owner. Ask your dealer questions about how to transfer embroidery designs to the embroidery machine. Ask about the maximum size for embroidery. The least expensive embroidery machine has a 4×4 hoop size. As you go up in hoop size the price goes up as well. 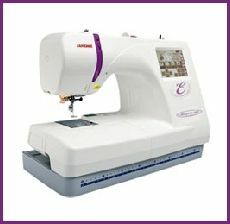 If you’re looking for an Embroidery Only machine, I personally love the Janome 350E. My favorite Sewing Machine brand is Janome. I own the MC6600. This is one fully loaded workhorse of a machine! 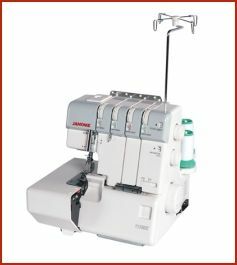 However, most ladies don’t need so much sewing muscle, so the model I recommend the most often is the Janome DC2011. When you start comparing features and prices, you’re going to find that, compared to other brands, Janome gives you a lot more bang for your buck. Pretty much any Janome you get will be a good machine. Whatever brand you choose, avoid getting a machine at Walmart, Target, Sears, department stores etc. The manufacturers do not support these models. Only the models that are sold at sewing machine dealerships are supported by the manufacturers. In other words, you won’t be able to get parts for a machine that you buy at Walmart etc. If you are planning to buy your machine online, don’t purchase until you make sure that your local dealership will be able to get parts for it in case you need repairs in the future. Also, dealerships are able to offer better warranties than online purchases, so be sure to do your homework before you buy! it’s accessories: long tweezers, screw driver for changing needles, etc. If you get a Janome or a Babylock, both of these brands can usually do a pretty rolled hem stitch. If possible, have the dealer demo the serger’s rolled hem before buying. I consider myself a serger expert. 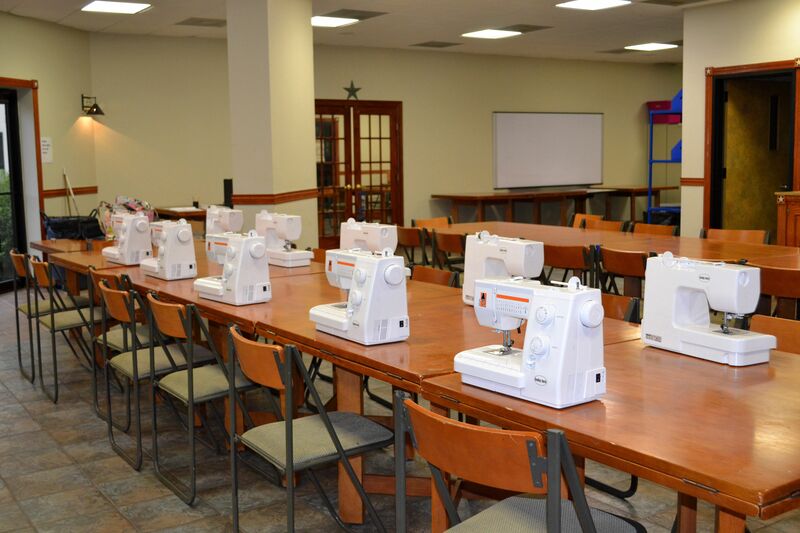 I teach a lot of serger classes each year. I’ve seen almost every model and brand you can think of. I’ve seen many a serger bite the dust in my Serger 101 class because of being a poor quality make & model. In my opinion, any current model of Janome or BabyLock Serger will be a good machine that will serve you well. My favorite Janome is the Janome 1110DX and the Queen of all sergers is the Babylock Evolution. As far as price, there are some other Janome models for less than the one I’m discussing here, but this one’s a little easier to thread. It’s the middle of the road machine. Not the base model and not the top of the line either. Many ladies have brought this with them to my classes and it’s always done great. Another exceptional brand for sergers is Babylock. They have jet air threading and automatic tension settings which makes them the easiest serger to use on the entire serger market. Pricewise, lowest to highest is: Imagine, Enlighten, Evolution (top of the line). These machines typically cost more than other brands, but they are so easy to use that it’s worth every penny. Well, I hope this helps you on your journey and machine hunt. This entry was posted in Embroidery Machines, Featured Machines & Cabinets, Machine Embroidery FYI, Serger FYI, Sergers, Sewing FYI, Sewing Machines, Tips/Techniques FYI and tagged embroidery, serger, sewing machine on November 9, 2011 by sewvacoutletblog. The Horizon Memory Craft 12000 will expand your sewing, quilting and embroidery to new horizons. You can see the Horizon Memory Craft at Sew Vac Outlet (Humble Sewing Center) on Saturday, October 1, 2011. This top of the line Janome sewing/embroidery machine has a 15″ embossed stainless steel plate in the bed and 11″ to the right of the needle; it has the most workspace of any Janome. It has the largest, most stable embroidery system we’ve ever developed. And an amazing list of new features. The Horizon Memory Craft 12000 will change the way you create, and make the creative journey more enjoyable than ever before. Create and edit designs on the touchscreen in real time on your computer. Use your mouse to drag, drop and edit. This means your editing screen can be as large as your computer monitor. Or take your laptop with you to edit on the go. Our AcuFeed™ system has been a favorite among quilters for its amazing precision and power. Now it’s even better. AcuFeed Flex™ is easy to remove and comes in two widths with multiple feet to address different tasks. Design your own original decorative stitches from scratch. Using the Stitch Composer,™ it’s easy. 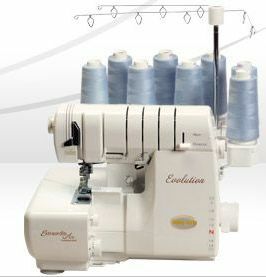 And your Memory Craft 12000 can use your new creation just like one of its own built-in stitches, altering length and width and adding it to combinations. It slips neatly onto the back of your machine to give you a bigger embroidery area than ever before, with even greater accuracy. So discreet and sleek, you can leave it attached for regular sewing. And it’s the only home-use sewing machine to allow Free Arm embroidery. Then there’s the 9mm Stitch Width, Auto Presser Foot Lift, One Step Needle Plate Conversion, Variable Width Zigzag during FMQ, and so much more. This entry was posted in Embroidery Machines, Featured Machines & Cabinets, Sewing Machines and tagged 12000, embroidery, horizon, houston, janome, memory craft, Sewing FYI on September 8, 2011 by sewvacoutletblog.